We spent about a week before and after the wedding, setting everything up. On the day before, and day of – even the day after! – we were running around constantly and barely got to see each other. Because of this, some of the happiest time during our wedding day was when we had our photo session after our ceremony with our photographer. It was just us, lots of hugging, playing and laughing.. and looking fab! It was wonderful to spend the day with everyone, but also quite overwhelming, so it was honestly nice getting to take a break from that. Ciara’s most emotional moments were, first, when Brendan started into his vows, and then during her dad’s speech. It is all a massive blur, to be honest! We had a lot of people flying in and camping on-site, so the celebrations lasted from about the 14th until the 20th of August! On the day itself, our favourite part of celebrating was mingling during cocktails and after dinner – catching up with friends and family – making memories. We actually didn’t include any cultural traditions. We thought about it, but out of all the possibilities of what to do, cultural traditions didn’t really make the cut. Our wedding was very personal. 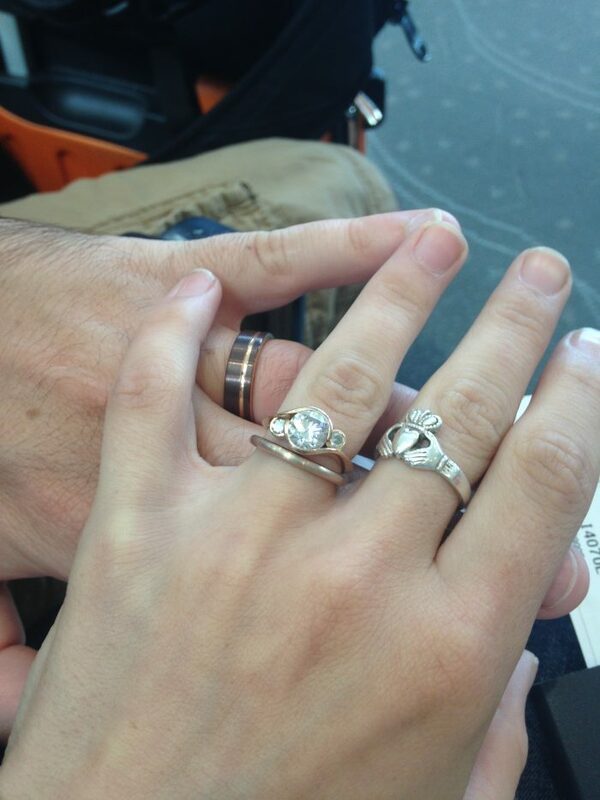 First of all, to cut the tension, the second surprise that we threw in was the honeymoon destination! Tables were labelled with countries rather than numbers, and throughout the festivities each table had to complete three games. Everyone was told that the winners would get prizes (which they did) but what they weren’t told was that the country of the table that won would be our honeymoon destination. Other personalisations ranged from having everything at Ciara’s grandparents’ farm (following in line with the marriages of 4 other Thompson couples! ), using a tap bar for the beer that her uncle made, giving Ciara’s mother’s homemade jam as favours, having Brendan’s brother (a pastry chef) make all the desserts, getting the wine from a vineyard just up the road, emphasising bilingualism (Ciara is American and Brendan is French), incorporating our favourite music throughout the day, as well as subtle travel themes, which drew attention to our story as a long-distance couple. Not yet! The winning table was……….. The Philippines!! We have never had a vacation like that, and we are so excited to go on that adventure, but we do have to save up a little bit and recover from writing cheques during the wedding. We’ll let you know how it goes! These photos were taken during our photo session after the ceremony. We took a walk around Ciara’s grandparents’ pond, played with the photo booths that we set up, did a bit of swinging… It was very fun! We were both happy and relieved – the ceremony was finished, and we had a bit of time to relax during cocktail hour while the caterers were setting up dinner. We took the formal pictures with the wedding party and families before the ceremony. We felt it would be awkward for the guests, during cocktails watching the braintrust getting their photos taken. This way all the guests were busy getting ready, and we could take a little break from putting everything together to pause, and smile for the camera. We were all feeling good at the time, but a bit stressed; trying to keep on schedule and see that everything is going okay. This was a good way to break that pre-ceremony tension. Ciara’s dress was from Essense of Australia, and she is absolutely in love with it. 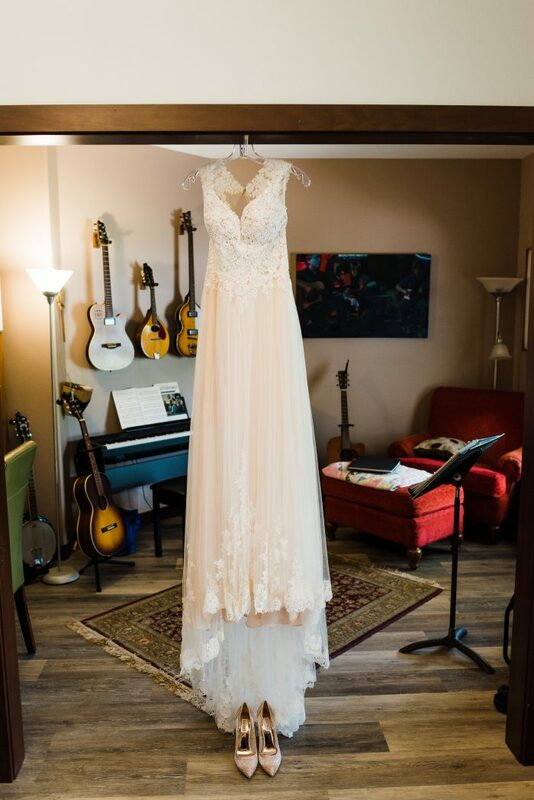 She bought from Dora Grace Bridal in Ft. Collins, Colorado. She is the youngest child, with two older brothers, so this was a special mother-daughter adventure to go on. They had fun trying on dresses all day, and swiping through pictures later on until this dress came through as the perfect fit. Ciara’s mother was less enthusiastic about buttoning all those buttons on the day! Again, another break from the madness! Our ceremony was just perfect. You can see in the pictures, we were very happy, and had a lot of fun in the moment. 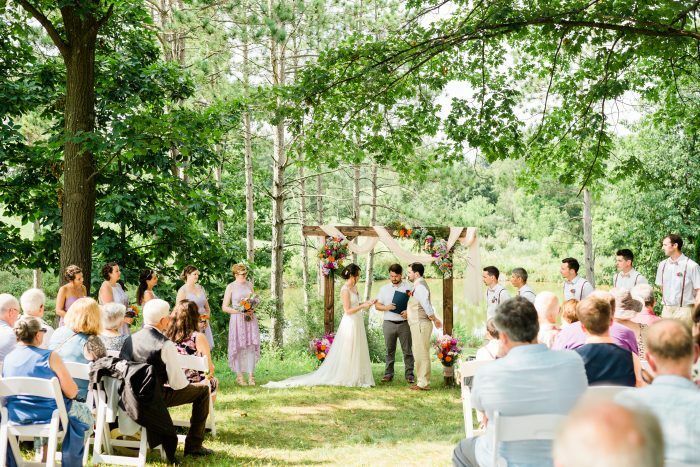 It was on a small hillside, under a wedding arch that Ciara’s dad made, by her grandparents’ pond. It was a disconnected ceremony, so we encouraged everyone to put away their devices and just enjoy that moment with us (there were a few snaps in the end, but we tried). One of our very good friends, Brice Bougard, performed the bilingual ceremony, switching with ease between French and English. We wrote our own vows, and the ceremony lasted, in total, about 30 minutes. Running back down the aisle through flower petal confetti, we segued straight into the cocktail hour. We really were blown away with the flowers. We got them through Anna Geyer’s cutting garden, and that was a fun trip in itself. On the rehearsal day, Ciara, her mom, the bridesmaids, and some more helping hands went to Anna’s house, where she has several very impressive flower beds. With the colour scheme in mind everyone started cutting, and before we knew it, we had more flowers than we knew what to do with! 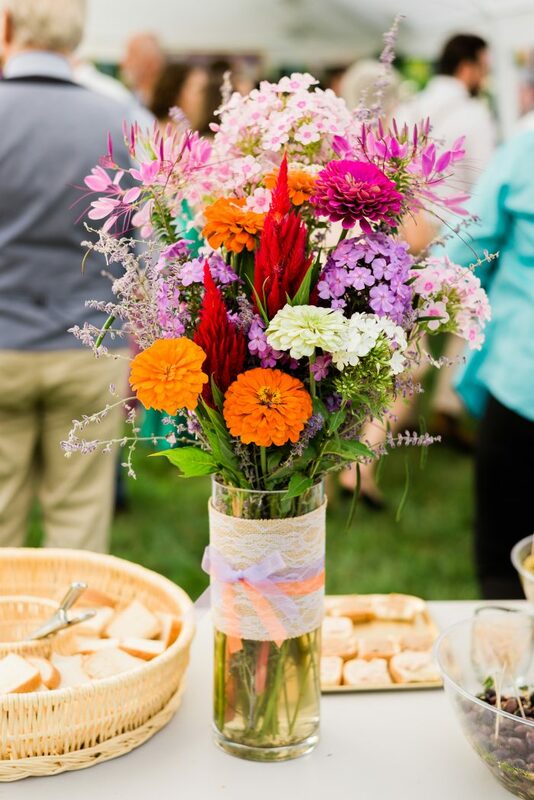 This took care of the smaller designs – the table vases, the vases at the bottom of the wedding arch, bridesmaid bouquets, boutonnieres, etc. Putting together those arrangements was a great bonding opportunity for those involved. Anna then arranged the larger pieces – the bride bouquet, hanging wedding arch arrangements, corsages, and the up-side-down flower chandelier! Her range of blooms, and skills in arranging were fabulous! Ciara’s grandmother has a lot of flowers around her house as well, so there were simply flowers everywhere! What could be better?! We are looking through these pictures, trying to pick some for you, and we are baffled by how much there actually was! On top of an amazing wedding day, there was also catered brunch the next day. How did we fit all of this into one weekend?! Looking back, in our own memories, there was a lot of running around, managing and telling people what to do. But when we look through our pictures, all we feel is happiness and thankfulness; so it seems that the stress melts away in the end. We had a cocktail hour (Apéro, in French), then dinner and dancing. 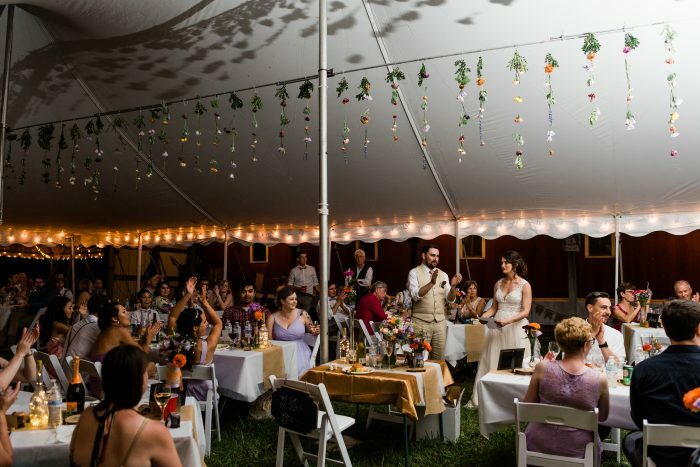 Apéro and dinner were in two different locations on the farm, so people had a nice walk down to the barn to find their tables. During dinner, there were speeches, games, and birthdays. Between dinner and dancing, Ciara’s dad (who among many things, is a professional magician) performed a special magic trick for us, and we revealed our honeymoon destination. The night ran much later than expected, and we ended up starting the dancing at about 11:30pm. Our first dance was to an acoustic cover of Ray Charles’ ‘Hallelujah I Just Love Her So’ (recorded by a good friend, Cillian O’Dalaigh). The mother-son dance was to Fool’s Garden’s ‘Lemon Tree’, and the father-daughter dance was to Stevie Wonder’s ‘Isn’t She Lovely.’ What an amazing night full of love, laughter, happiness and music. How Ciara managed to dance until 4am, and then be up to meet the caterer for brunch at 9:30am, we will never know! 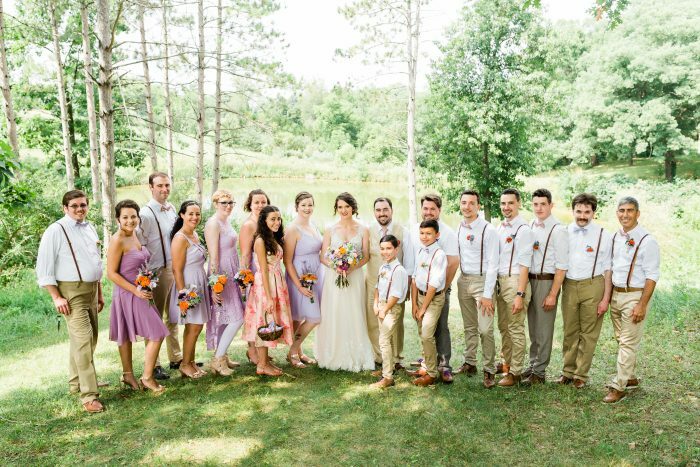 Throughout the days leading up to, and following the wedding, and on the wedding day itself, so many friends – new and old – came together, reconnected, made new friendships… Everyone pitched in to create an amazing wedding that everyone thoroughly enjoyed. We got the chance to catch up with distanced friends, make hilarious memories, and welcome new families into one another. Throughout that time we each laughed, cried, yelled and loved – a lot. Asking us to pick one single moment… is impossible. 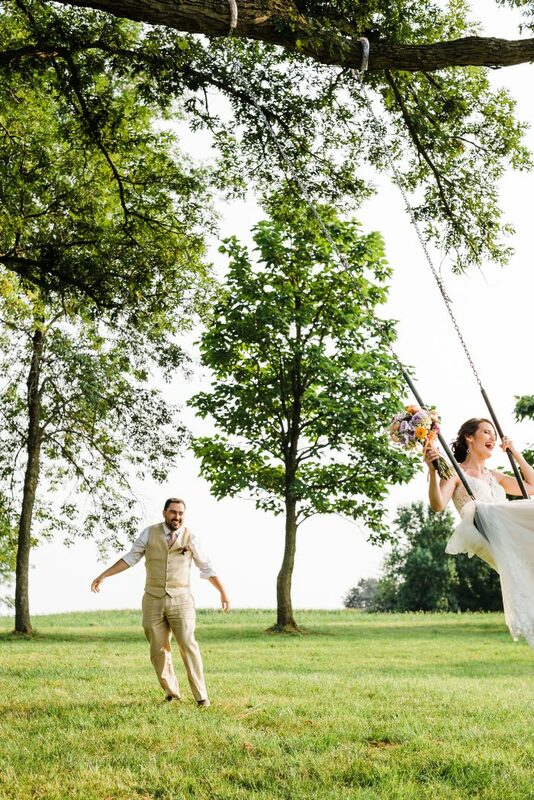 However, all that being said, we have selected this photo that you see because they encapsulate how we felt on the day, and they illuminate a time during the day that we were very thankful for, getting to play around and be together, just the two of us. Again, very impossible to pick just one photo! several of our favourites are included throughout this spread, and we don’t want to throw in repeats, so we have chosen this one. This is Ciara’s dad’s favourite tree on his parents property; he calls it the Empress. It is old and vast and beautiful. 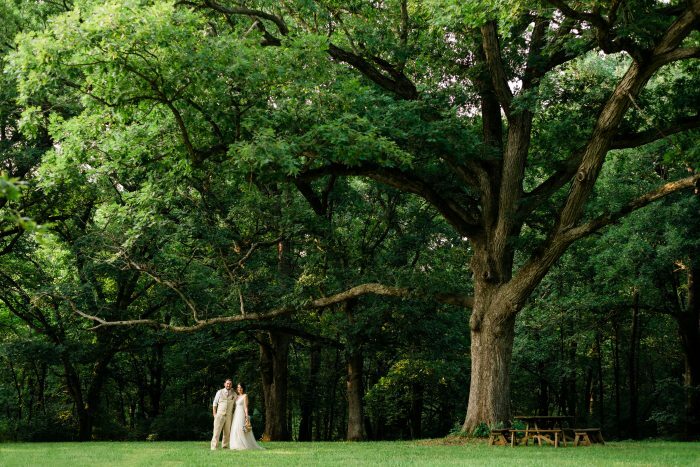 We love this picture because of how tiny we look standing under this enormous tree. We also like it because it nicely represents the supports we had throughout the wedding. 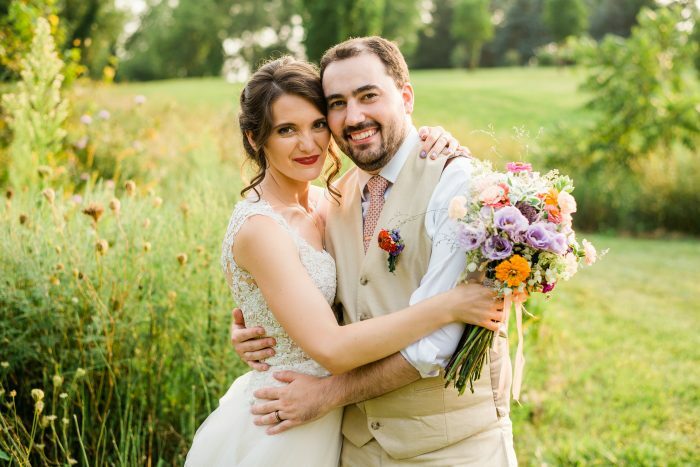 Literally everyone attending the wedding helped us put it together in some way, and we are so thankful for that enormous support that covered us, and helped to build the day into something absolutely wonderful.